I have been enjoying a lot of fresh locally grown produce from the farmers market lately but I realized that I have not been doing much with green vegetables. Green beans are one of my favorite green vegetables and they had some nice looking ones at the farmers market which I picked up. I have come across several Chinese recipes that include both meat and vegetables but where the vegetables are the primary ingredient and the meat is more of a garnish. I liked the idea of the increased prominence of the vegetables in a meal and wanted to try it. I had been craving something spicy and I decided to go with some of my favorite flavours in a Sichuan style meal. The green beans with Sichuan ground pork came together quickly and easily. The dish was really tasty and had a nice level of heat. The fact that the dish was mostly green beans made it a nice light meal along with some rice. I liked this kind of meal and I will have to try to work more vegetables into my dishes. Add the green beans, fermented black beans, chili bean paste, chili sauce, Sichuan peppercorns, soy sauce, and chicken stock and simmer until the green beans are just cooked, about 5 minutes. Remove from heat and mix in the sesame oil and green onions. Your green beans are simply beautiful! I love green veggies best, to the extent that my kids are so sure I like green foods above all others that they give me all the green M&Ms out of their packages (maybe there's benefit to liking green veggies, after all!). I hope this meal tasted as good as it was pretty! That looks fabulous, Kevin. Those green beans look so colorful and crunchy, and I love the flavor of Sichuan. I love ordering that dish at Chinese restaurants, but I think I like your version better! At least it’s not swimming in oil. This sounds like it would be simply beyond fabulous! Great recipe. Looks good man. But you know – I think I’d need to season up those green beans a bit. I think a quick blanch to preserve the flavor and color and then a toss in a garlic infused olive oil with a sprinkle of salt and a good amount of fresh cracked pepper…then top it w/the pork. But yea man…good cooking! sichuan pork is great… this looks really colorful and delicious. Yay the white dishes and woven mat are back. Yes they are your signature look. And where do you find perfect green beans? The meal looks wonderful and sounds perfect…clean crisp veggie and a bit of interest and contrast. great use of green beans. Gives me an idea of what to get for the next grocery shopping trip. I have a small tip though. If you peel of the end of the green beans and pull along the edges to remove the “seam” at the side, you get softer green beans. The color on those beans are just perfect which means you cooked them perfectly.I love Sichuan pepper! Lucky you! I make Sichuan Green Beans quite often and yours looks like it turned our yummy! I love a hot kick too! Terrific picture! What a great contrast of colors. Mmmmm YUM – I will be making this as soon as – it looks delish! I have a bag of those black beans but have never got round to using them. I can’t wait for my day off in the week to try this one – thanks Kevin. That looks lovely and fresh, Kevin. It’s nice to not have the meat as the main ingredient. Great combo. I love green beans, and although I like meat too, I’ve noticed I feel much better when vegetables are prevalent in my diet. Mmm… I love the idea of a Szechuan style pork! In Malaysia, meat and veg dishes are very common. Stir fried brocolli with beef in a black pepper sauce is one of our faves. Now that’s a great way to eat green beans! The color on those green beans is just perfect. The flavor and crunch have got to be phenomenal. I like that these aren’t greasy like most of the green beans served in Asian restaurants. Gorgeous color..as usual!! Mmmm can’t wait to try it. I tried another recipe you have with steak and peppers, I don’t know what fermented beans are as I was in the grocery store I picked up black beans in garlic sauce from the Asian section and used that as substitute and it came out good. I’d like to try these recipes with what you used, so for my silly question I’m sure, where do I find fermented beans? This looks really delicious. I have been seeing similar recipes/ideas lately, too, and have been meaning to try something like this myself. 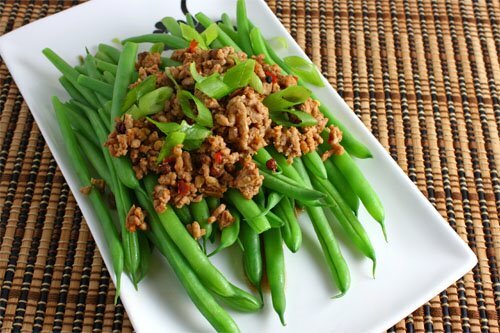 Green beans and Sichuan Pork…My two favorite combo’s, this is such a keeper. Well done, Kevin. I agree with you, this type of dish is right up my alley. I would love to make this. Your dish looks way better than the crap in some restaurants. This is bookmarked. Looks great, and another way I can use my favorite new ingredient – fermented black beans. You surely get a nice variation in your meals. I really like everything you make. Debbie: The black beans and garlic sauce is a great substitute as it is made with the fermented black beans and it is really tasty. You should be able to find the fermented black beans at a local Chinese grocery store. I brought a piece of paper with the Chinese symbols on (豆豉 – Douchi) and showed it to an employee are found them right away. What a cool take on green beans. They are one of my favorite vegetables (I think I say that about a lot of vegetables). dfkThe green beans are sooooo green! Wow! I wish I could find beautiful green beans like that here! How gorgeous these beens are – such a vibrant colour. Green beans and peas were some of the few vegetables I used to eat as a child – now I eat practically anything! Love the sound of this dish.